Bob Hope was no stranger to Washington. The comic was well traveled and visited the nation’s capital numerous times for performances and events particularly through his work with the U.S.O. Hope and his wife Delores also periodically came to town to visit their son, Tony, who was a student at Georgetown in the early 1960s and, later, a Washington attorney and lobbyist. 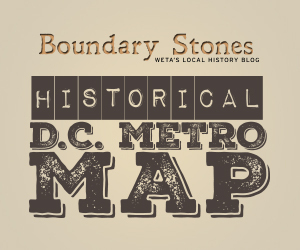 In 1968, however, Hope was angling for a more permanent connection to the District when the Washington Senators baseball club went up for sale. One of the most famous movies set in Washington is The Exorcist, the 1973 tale of a Roman Catholic priest's struggle to save a 12-year-old girl named Regan (Linda Blair) from demonic possession, which transfixed theater-goers with its phantasmagoric gore. The William Friedkin-directed film not only was a box office smash, but also became the first horror film ever nominated for Best Picture at the Academy Awards, and four decades after its release,The Exorcist and its D.C. connection continue to resonate in the public imagination. Case in point: The film's shocking climax, in which the progagonist, Father Damien Karras (portrayed by Jason Miller) takes the demon Pazuzu into his own body and is hurled to his death, has turned the steep set of steps in Georgetown where it was filmed into a macabre local landmark. But The Exorcist has another, even more unsettling connection to the Washington area. William Peter Blatty, who wrote both the screenplay and the bestselling 1971 novel from which it was derived, was inspired by an actual case in which a 14-year-old boy purportedly was possessed by the devil, which occurred in Prince George's County 65 years ago.